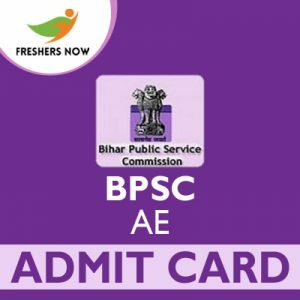 BPSC AE (Civil) Mains Admit Card 2019 is Available Now!!! Good News for the candidates applied for the BPSC Assistant Engineer Examination 2019 that the higher authorities of the Bihar Public Service Commission are planning to conduct the Civil Assistant Engineer Examination 2019 from 27th March 2019 To 31st March 2019 to fill 1284 vacant positions. So, all the eligible candidates can download their BPSC AE Hall Ticket 2019 from the official site @ bpsc.bih.nic.in online. Moreover, the Admit card for the exam is released on 19th March 2019 on the Official website of Bihar Public Service Commission (BPSC) @ bpsc.bih.nic.in. Therefore, all eligible candidates can grab this opportunity. This page provides you with the complete stuff required for the exam likewise Selection Process, mandatory documents etc. Also, the direct download link for the admit card is also provided at the bottom of this page. Candidates applied for the examination refer to this page for the complete details regarding the BPSC Assistant Engineer Examination 2019. The higher authorities have released the dates for the exam and admit card. Hence, candidates can prepare for the exam during this period. Moreover, refer to the complete page for the detailed information. The officials of the Bihar Public Service Commission (BPSC) planned to conduct the test on 27th March 2019 To 31st March 2019. The selection process for the BPSC Assistant Engineer Examination 2019 mainly consists of two rounds. A WRITTEN TEST and an INTERVIEW round. First, the eligible candidates will get the admit cards for the examination. Then, the candidates need to attend for the written test. The aspirants with marks higher than the cutoff mark will be shortlisted for the interview round. In the interview round, only the best-fit candidates will be recruited for the post. Before appearing for the exam, candidates are advised to check the particulars on the hall ticket. If any the details are not correct, then it should be get rectified by the officials. The details are in the same fashion mentioned below. Before appearing for the BPSC Assistant Engineer Examination 2019, all the aspirants should carry some important documents to the examination venue. Moreover, these documents are required for the verification purpose conducted by the examiner. Hence, all the candidates are advised to take any one of the mentioned documents as proofs for the examination. The list of the documents is in the same fashion provided below. Also, do not forget to carry the BPSC AE Hall Ticket 2019 along with these mandatory documents. This section provides you with the stepwise procedure for downloading the BPSC AE Hall Ticket 2019. Candidates who are with difficulty in downloading the hall ticket can follow these steps. Also, you can download the hall ticket using the direct link provided at the bottom of this page. Read the steps carefully and download the hall ticket. First, candidates should visit the official web portal of the Bihar Public Service Commission i.e., bpsc.bih.nic.in. Then, the home page of the website w2ill display on the screen. Moreover, the home page consists of various links about different notifications. Search for the required BPSC Assistant Engineer Mains Admit Card 2019. Then, make a click on the link when it is found. Give the details in the required fields likewise date of birth, application number and so on. Therefore, your details will be submitted and you will get the BPSC AE Mains Hall Ticket 2019. Download the admit card and take the xerox copies it. Candidates should note that the higher authorities have not yet announced the BPSC AE Admit Card 2019 release date. Hence, keep visiting our page frequently. As soon as the officials announce the dates, we will intimate you through our page. For any further information or queries, you can ask us at freshersnow.com. All the best for all the aspirants.